Victory at Verrado is a resort-style community in the scenic White Tank Mountains. Victory at Verrado is a 55+ community in Buckeye, AZ that caters to the needs of modern active adults. Nestled against the foothills of the White Tank Mountains, this vibrant community offers a resort-like experience while showcasing the beauty of the surrounding mountain and desert terrain. Victory at Verrado is only 35 miles from Phoenix, making trips to the city a breeze. Residents of Victory can enjoy all of the conveniences of the larger master-planned community, Verrado. With its strong sense of community and high-end amenities, Victory at Verrado is quickly becoming known as a premier destination in the Phoenix area for active adults. Below we’re taking a closer look at what makes this community a top choice. Development of Victory at Verrado broke ground in 2015 and is ongoing. With five builders working on the development, homebuyers can expect many options for floor plans. Builders include CalAtlantic Homes, Lennar Homes, Maracay Homes, Taylor Morrison, and TW Lewis by David Weekley Homes. Once complete, the community will have 3,500 single family homes. Inspiration by Lennar offers four distinct floor plans ranging from 1,222 to 1,657 square feet. Prices begin in the low $200s and reach the high $200s. These residences all have two bedrooms, two bathrooms, and an attached two-car garage. They also feature desirable modern features, such as spacious first-floor master suites and walk-in showers. CalAtlantic Homes offers a number of floor plans ranging in size from 1,542 to 1,870 square feet. Most models have at least two bedrooms, two bathrooms, and an attached two-to-three-car garage. These homes are priced between the high $200s to the low $300s. The spacious single-family homes by Lennar are between 1,890 and 2,300 square feet. They all include two bedrooms with an additional den, two or two-and-a-half bathrooms, and an attached two-car garage. These homes are a great option for modern, low-maintenance living. They are priced between the high $200s to the mid $300s. The Venture II series of homes by Taylor Morrison is available in five different floor plans ranging from 2,234 to 2,870 square feet. These spacious residences have three bedrooms, at least two-and-a-half bathrooms, and attached two or three-car garage. Prices begin in the mid $300s and reach the high $400s. Maracay Homes offers a line of single family homes ranging in size from 2,280 to 2,685 square feet. They are an excellent option for homebuyers seeking plenty of space and a low-maintenance lifestyle. These homes have two to four bedrooms, at least two bathrooms, and attached two or three-car garage. They are priced between the high $300s to the low $400s. The largest homes are offered by builder TW Lewis. These single family homes are between 2,563 to 3,500 square feet and come in a variety of floor plans. Most homes include three bedrooms with an additional den, at least two-and-a-half bathrooms, and an attached two-and-a-half or three-car garage. These highly customizable homes are priced between the mid $400s to the high $500s. Victory at Verrado was designed to provide an immersive, resort-style experience for residents. The Victory Club, a 35,000 square-foot clubhouse, is where residents can enjoy a host of amenities, including a 7,000 square-foot fitness center. Residents can stay active with state-of-the-art gym equipment, indoor studios, and an outdoor yoga lawn that offers views of the White Tank Mountains. There are three outdoor terraced pools that offer beautiful views of the surrounding hills. With secluded fire pits by the pools, residents can socialize with neighbors and unwind in a tranquil setting. There is also an outdoor lap swimming pool with five wide lanes. With walking and biking trails, tennis courts, and two golf courses, residents have no shortage of ways to enjoy themselves and stay active. When residents want to dine out with neighbors they can head to the community’s on-site restaurant, The Vic Bar + Kitchen, which offers a chic twist on American cuisine. With events like live music, pool parties, and regular meet-ups, it’s easy for neighbors to stay social and make lasting connections. Victory at Verrado also features its own spa, where residents can indulge in pampering treatments, massages, and salon services. Since Victory is part of the larger master-planned community of Verrado, residents have access to all amenities within the entire community. Currently, the homeowners' association fees are around $190 per month. Victory is part of the master-planned Verrado community that covers over 8,000 acres. With a pedestrian-friendly Main Street, tree-lined sidewalks, and charming neighborhoods, it feels more like a small town than a housing development. Residents of Victory at Verrado can take advantage of the community’s many on-site conveniences, including restaurants, cafes, bistros, and wine bars. Verrado also has a grocery store, drug store, and other shops for running daily errands. When residents want to enjoy some outdoor recreation, they don’t have to travel far. Victory at Verrado is nestled in the foothills of the White Tank Mountains, so activities like hiking and camping are just a short drive away. 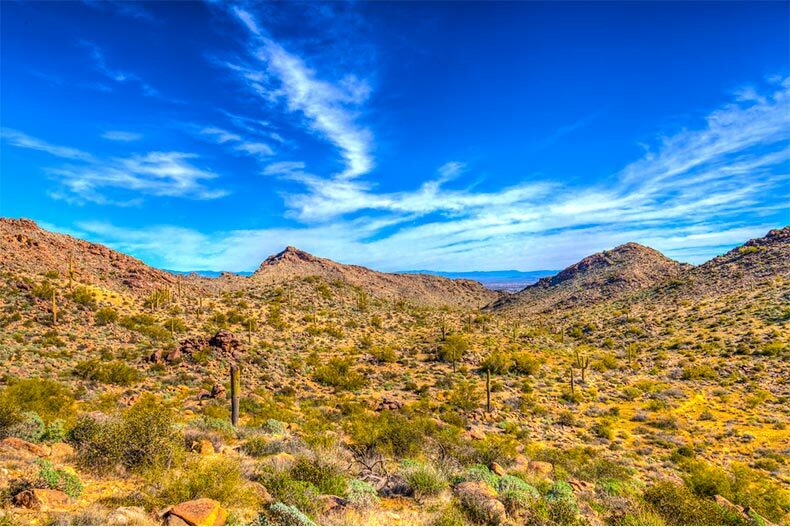 Both the White Tank Mountain Regional Park and Skyline Regional Park are great options for enjoying the beautiful Sonoran Desert. The community itself also offers a number of walking, running, and biking trails. Residents can stay active with over 21 miles of trails throughout the Verrado community.